Most top-notch courses in the USA are set aside for the exclusive use of club members and their guests but we take our hat off to Yukihisa Inoue, the president of World Woods. His philosophy, and hence the name behind his corporation, is the provision of world-class golf for all to play. The 1993 Tom Fazio designed Pine Barrens course at the World Woods Resort is therefore a triumph for the people, along with its sophisticated next door neighbour, Rolling Oaks. Joe Black, past President of the PGA of America said, "This is like having Pine Valley and Augusta, plus the best practice facility in the world - in the same location." We think Black got slightly carried away but World Woods is genuinely a high-class golf resort which will put a huge tick in the box of every avid golfer. The World Woods' mission statement is “to provide the greatest experience that our guests have ever encountered at a golf facility in regard to golf course conditioning, service, professionalism and overall staff knowledge and to thereby become the #1 golf facility in Florida.” Recently, the mission statement has been revised from "Florida" to the "USA". It’s an admirable target but a huge ask. Pine Barrens is a course that is at once attractive but also frightening and we can see what Joe Black meant when he mentioned the similarity to Pine Valley. 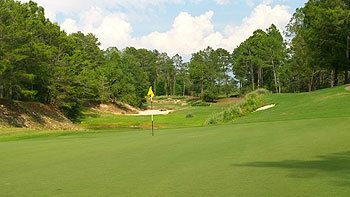 The fairways at Pine Barrens are naturally pine-lined with huge expanses of sand, almost waste-like bunkering. Carved through a pine forest this is not a course for the wayward driver, keep the ball in play and you might card a decent score. In Golf Magazine’s Top 100 Courses You Can Play book by Brian McCallen, the author thinks the course “looks far more intimidating from the tees than it actually plays. There’s room galore to drive the ball, but approach shots must be pinpointed to well-protected greens laced with bold, provocative contours, greens that are slick (especially from above the hole) but not terrifying in their speediness. “The first hole, a straightaway par four, signals the layout’s intentions. From an elevated tee, a player’s attention is drawn to a large sand pit on the left side and a long sandy trench up the right side. The small, crowned green slopes away on all sides. As opening holes go, it is as pure and fair as they come. Pine Barrens #1 is a classic welcoming hole before the sucker punch of the long par 4 second. For your approach favor the right side of the green as there is a severe tilt left. One thing that did surprise me was how few water hazards there are. There is one on the par 3 3rd and I found it. The par five fourth at Pine Barrens is a super golf hole. On the tee you must decide to play it safe or go for it. The left side is safe, but if you go right you have a 200-yard plus carry to a much narrower fairway. The elevated green is protected by a monster bunker on the front right. If you play it safe and come in from the left, the bunker shouldn’t really come into play, but if you played down the right side it is at best intimidating and at worst terrifying. The par 4 8th is deceptive, the fairway feeds left to right into a waste area and the multiple tiered green is really a peninsula in a waste area. The back starts with a long par 3 with a false front. Aim left as it tilts right. The 12th is along par 4 with two different green options. The right green is much more challenging as it is protected by a waste area and is elevated. Frankly, when the right green is used the hole is even tougher but it is a better golf hole. The last five holes at Pine Barrens are super closing holes. Off the tee on the par 5 14th there is not a lot of trouble but after that there are multiple hazards and very narrow landing areas. A nice risk/reward hole is the par four 15th. It is a dogleg right around a water hazard. It is at least 225 yards off the tee to carry the hazard to set up an easy pitch to the green. The par3 16th is the signature hole. It is long, uphill with imposing waste areas on the right side with a green that tilts significantly to the right. The 18th is a long par 4 that is best played coming in from the left. You need to carry the waste area but not be too long or you will be blocked out. Played Pine Barrens last Saturday and Sunday in the late afternoon after playing Rolling Oaks on Friday. The Future Collegians World Tour conducted a tourney for 11-19 year olds at the course on both days earlier in the day. First of all, I'll say World Woods is an excellent golf club. It is about the golf and the practice facilities. And it's open to everyone. Course designer Tom Fazio has described World Woods as being comparable to having Augusta National, Pine Valley and the finest practice facility in the world, all together in the same location. He also has said about World Woods that "This is my best work." The practice facility is certainly the largest I have seen. It includes a 22 acre practice range; 2 acre putting course; par 3, 4, and 5 practice holes; as well as a 9 hole short course. Unlike Rolling Oaks, all the bunkers at Pine Barrens are waste bunkers. The waste bunkers gave all the holes definition and clearly everything was in front of you. All the holes were a pleasure to play and it was nice not to see a house anywhere, on either course. The first hole starts with a 427 yard par 4 that the drive favors the left side of the fairway. A waste bunker is on the entire right side of the hole. The second hole is a long 483 yard par 4 with waste bunkers guarding both sides of the fairway. There are no bunkers guarding this green and the green slopes broadly from right to left. The third is a picturesque 174 yard par 3 with a pond guarding the front and left of the green. A huge waste bunker guards the right side of the green. The fourth hole is a 526 yard par 5 that is one of the most visually appealing holes I have ever seen. A waste bunker is on the entire right side of the fairway. Shorter hitters can keep it down the narrower left side but longer hitters can hit over the waste bunker (about a 260 yard carry) and have a good opportunity to reach the green in 2. The fifth hole is the second shortest par 4 at 382 yards. The hole is a slight dogleg left with the preferred drive on the right side which will give a good birdie opportunity to the elevated green. The sixth is a 543 yard par 5 with waste bunkers guarding both sides of the fairway. The green can be reached in 2 but if you lay up the preferred angle is on the left side as waste bunkers guard the green short right of the green. The seventh is a solid 207 yard par 3 that plays downhill and is protected by waste bunkers on the left, right, and back left of this green. The eighth hole is a nice 434 yard dogleg right par 4 with the preferred drive down the left side as a large waste bunker guards the right side. The green is protected on 3 sides by a large waste bunker and precision is required on the second shot. The ninth hole is a solid 419 yard par 4 with a fairway that slopes from right to left. The preferred drive is down the left side as it is flatter and provides a better angle to the green. The green is protected by waste bunkers on both the right and left sides. The tenth hole is a nice 228 yard par 3 that has a narrow green that slopes from right to left. A large waste bunker protects the green short and left of the green. The eleventh is a slight dogleg right 434 yard par 4 with no fairway bunkers and the green is protected short and left by a large waste bunker. The twelfth is the longest par 4 on the course at 491 yards and the preferred drive is down the left side of the fairway. A huge waste bunker protects this elevated green and the green slopes broadly from back to front so balls will come back if hit on the back of the green. The thirteenth is a 465 yard downhill par 4 that doglegs to the right. Waste bunkers protect the green on the right and left. The fourteenth is another visually appealing 587 yard par 5 that doglegs to the left. The green can be reached in 2 with a drive that carries the waste bunker on the left. The preferred layup is to the right as it is a good angle to the green and a good birdie opportunity. This hole has many strategically placed bunkers and trees. The downhill fifteenth is the shortest par 4 on the course at 339 yards. Longer hitters can try to reach the green on the tee shot but for me the preferred drive was down the left side avoiding the waste bunkers which allowed a short wedge and good birdie opportunity. The sixteenth is the signature hole of the course and is a solid 227 yard par 3 that is protected by waste bunkers on the right side. The green slopes left to right and balls going left can end up on the green. The seventeenth is one of the shorter par 4s at 398 yards with the preferred drive down the right side as trees overhang on the left side of the fairway. 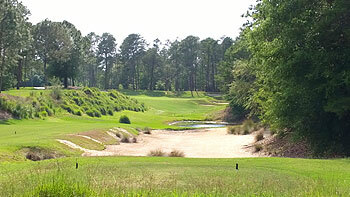 Pine Barrens finishes with a strong 473 yard par 4 that doglegs to the left. Waste bunkers protect the left side of the fairway and the green is protected by a large waste bunker on the right side of the green. Played the Pine Barrens course in December 2012 and only just got round to this review. It is outstanding, as has been said many times on here. Us Brits would liken it to Woburn on better and in the sun. Not a bad hole in the 18 and for very little money too, compared to what you can pay in Florida. We will be rushing back this year and hopefully play the Rolling Oaks course too. World Woods never fails to deliver. This was my fourth visit since the mid 90's and there will most likely be a fifth. Especially Pine Barrens is a truly great course but Rolling Oaks is a lot of fun too. If you, like we did, base yourself on the coast in St Pete and also throw in a couple of trips to Streamsong, I doubt you'll find better public golf outside Bandon. Couldn't agree more. And don't forget great courses in this area like Innisbrook Copperhead and Southern Hills Plantation that are open to the public too. An outstanding course. Doesn't feel like FL golf at all. Great design and great lay out. The scenery is spectacular. Could be in the World TOP100. An outstanding golf course, by far the best public course in Florida.Not a weak hole at all, the holes range from good to very good to pure masterpiece.Holes to note are 1,2,4,12,14 may be some more. But once again - there is no weak hole on this course. The green complexes are outstanding as well.A great bang for the buck it is, BTW. Very solid golf at a reasonable price.This place is all about the golf and not about the glitz at all.There are 4 terrific holes that will be life long memories and 10 very solid golf holes. 4 are just so-so...but they are far from bad.For the price you pay, you will love the golf.However, I do wish they had a hotel attached to it to make playing it easier for the out of towner. The reviews below are missing the point. This facility is for golf enthusiasts - those who eat, drink, think, dream of, practice and take their time - playing golf. Fazio did not intend to design a "Kohler of the South" or a "Bandon of Florida". There are no resorts close by, this is not a resort course - hell, this is not even a Florida course. Take a day and play both the Pine Barrens course and Rolling Oaks course without considering anything but the fact you're playing in the midst of dreamlike conditions. Pine Barrens is quirky, dramatic, intimidating and unlike anything else south of Pine Valley. Rolling Oaks is more reserved in terms of eye candy but equally as epic - featuring "Augusta" like feel. Very traditional, white sand bunkers with sweeping fairways along rolling terrain. ^^ Ding ding ding -we have a winner. This guy understands golf. Well put.